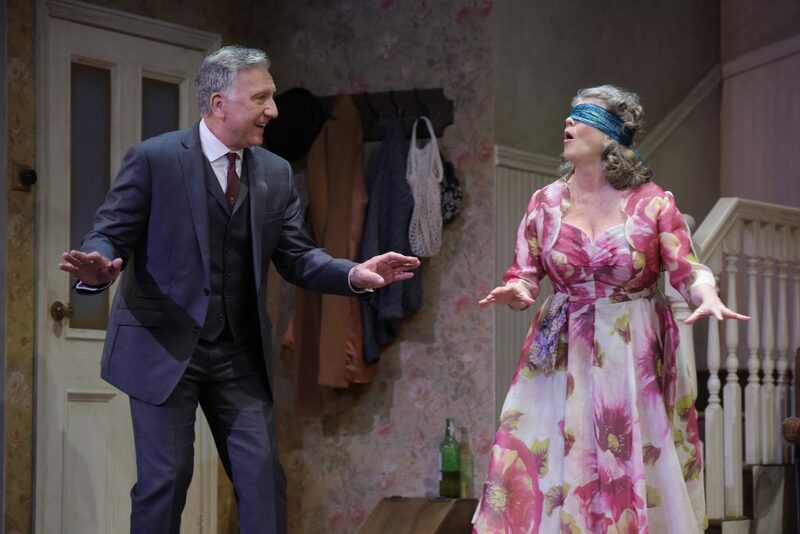 “The Birthday Party” Shocks with Political Allegory, at ACT, S.F. “The Birthday Party” (1958), by Nobel Prize winner Harold Pinter, is a scary “comedy of menace” because we never know whether geeky Stanley is an artist, a failed pianist, a criminal on the run, or simply a sad sack. Stanley lives in a rundown seaside boarding house in England, asserting himself feebly against annoying mothering by his landlady—and worse. From the old-fashioned print wallpaper to the fried bread that intrusive Meg (delightful Judith Ivey, two-time Tony Award winner) puts on the table for nebbishy Stanley (tortured Firdous Bamji), we sink into Set Designer Nina Ball’s brilliantly “ordinary” English cottage. 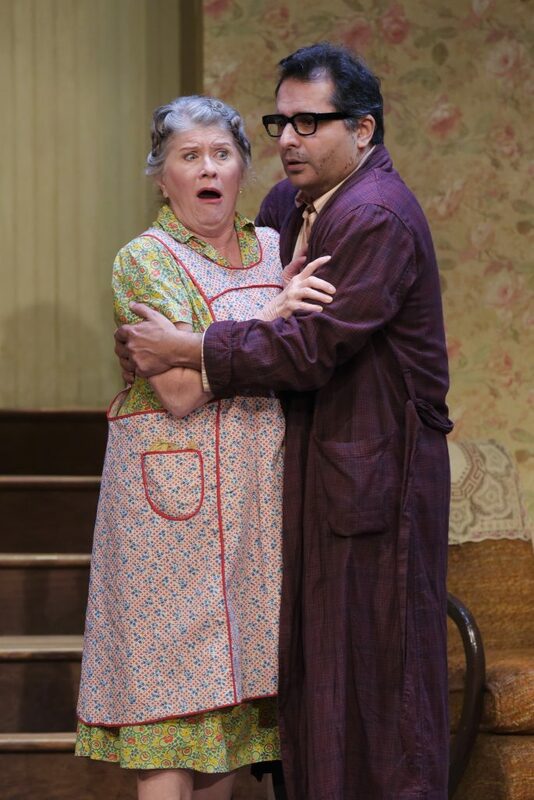 The elderly couple, Meg and Petey (wry Dan Hiatt), lives comfortably, but fearfully, repeating cliches to each other. The Cold War, the threat of change, and immigrants to Britain lurk at the edges of their precarious middle-class life. Meg offers Petey cornflakes topped with milk that has “gone-off,” while Petey concentrates intensely on trumped-up stories about Lady Anne Splatt and a stolen baby. 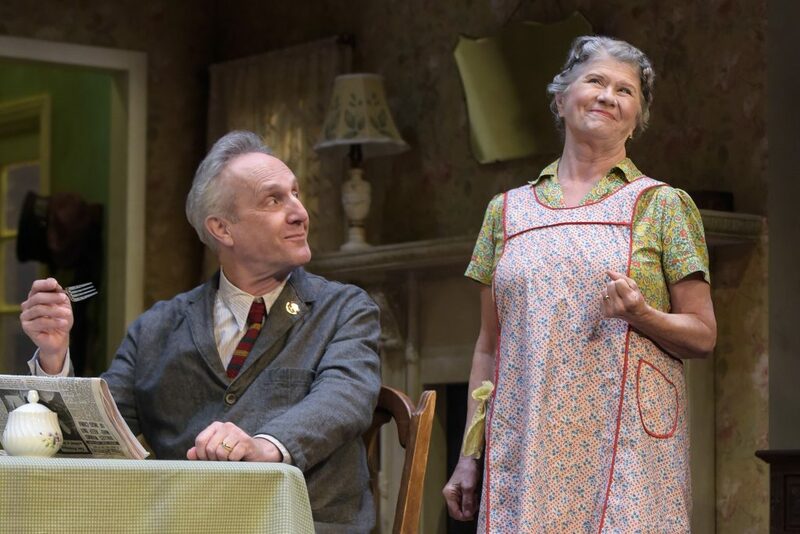 Playwright Pinter makes fun of their platitudes, while Ivey and Hiatt bring down the house with nervous laughter. Judith Ivey must be seen at the height of her comic powers. Under her sweet exterior, Ivey’s Meg coerces, seduces, and manipulates her pitiful tenant Stanley–and her anxious husband Petey–into an oppressive sit-com life. 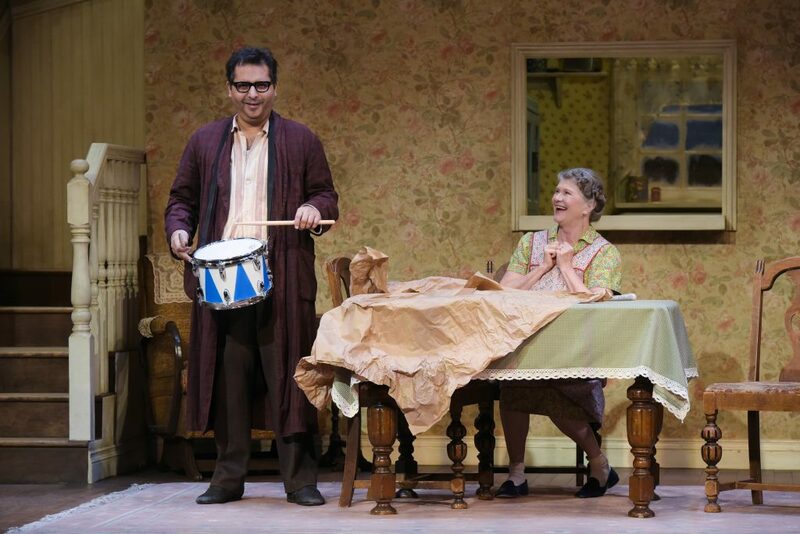 Firdous Bamji (Stanley) plays his new drum for Judith Ivey (Meg). The first act unfolds the banality of their lives. Meg chatters about the “nice” tabloid news and the “nice” cornflakes. Stanley mocks her, rebelling feebly. While pretending to be caretaking, Meg is all about Meg. Starved for attention and love, she runs in hilarious circles trying to be heard. After a pleasant intermission, Goldberg (straight-laced Scott Wentworth) and McCann (explosive Marco Barricelli), insist on staying at the downscale boarding house. They are tracking down and harassing pitiful Stanley, a prickly lonely little guy. Meg claims “her” Stanley is artist or piano player, but Stanley is living in fear. Quivering Stanley’s worst fears come true, and they are worse than Meg and Petey’s soap-opera paternalism. The smug British couple invite the harsher drumpfean duo into their tasteless castle. Under Dermott McCann’s heavy-handed interrogation and Bennie Goldberg’s fascist scrutiny, little Stanley withers. Goldberg and McCann, 50s slurs on Jewish and Irish immigrants, attack their hopeless victim. Scott Wentworth makes a wonderfully threatening and self-important Goldberg, as he sets up the ominous birthday party for Stanley. Cruelty, mystery, and terror rule. Goldberg, full of whirling words, recites a shocking litany of funny accusations about mother, family, and country. He indicts Stanley, an unmarried loner, as “disloyal.” Instead of Meg’s sentimentality, we get chauvinistic attacks using innuendo, lies, and hatred of the “other.” Goldberg and McCann, like Trump’s troopers, seize the day. Stanley ends up in a ridiculous sexual position, neighbor Lulu (enthusiastic Julie Adamo), in her tight slinky dress plays house with Goldberg. Who better than inquisitorial immigrants to subdue a non-conforming nebbish like Stanley? Nina Ball’s deliciously banal set perfectly displays Meg and Petey’s shallow, fearful lives. 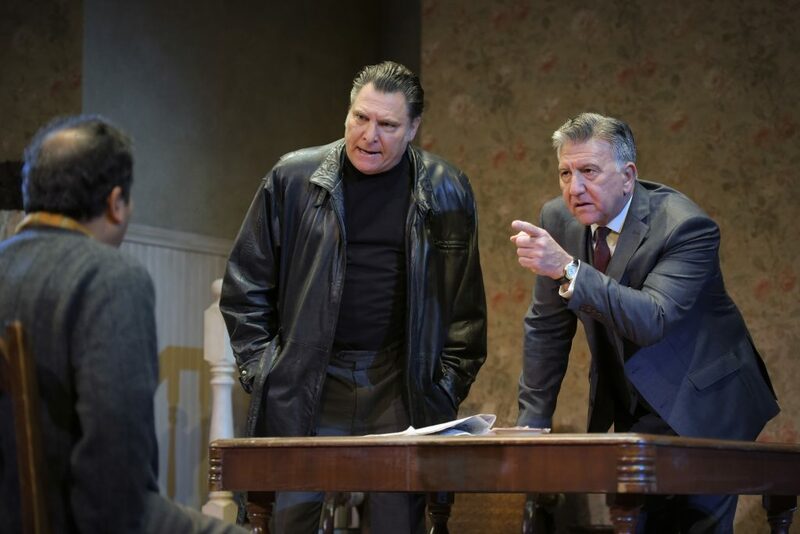 All hell breaks loose at the faux birthday party: Pinter’s comic jab at jingoistic hatred of the outsider. He who does not conform must be destroyed at this terrorizing birthday party. 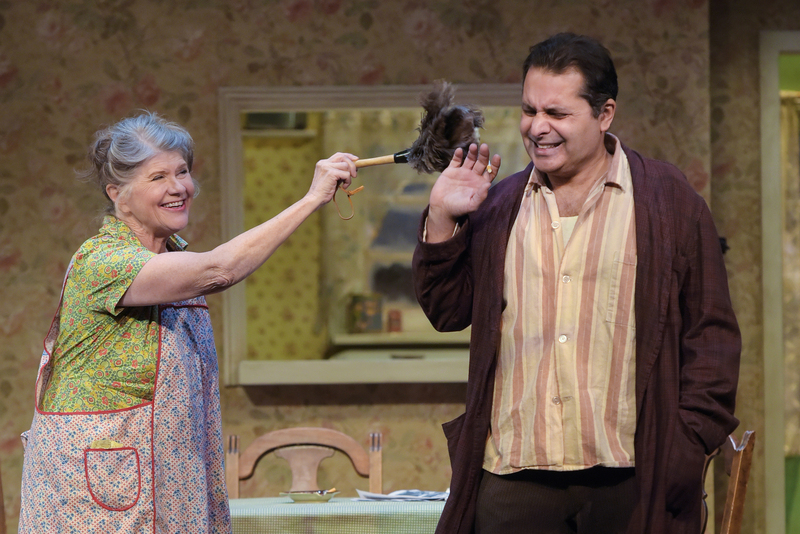 Cast: Judith Ivey, Dan Hiatt, Firdous Bamji, Julie Adamo, Marco Barricelli, and Scott Wentworth.